Any plant that deals with hazardous material has risk of (accidentally) spilling off a drop or two of the dangerous products; this is why they absolutely need hazmat response safety tool kit. The versatile kit is not only a plant’s first response to hazmat spills, but it also gives comfort knowing that the handy kit is available within close reach. All those FM-approved non-sparking, non-magnetic and corrosion-resistant tools are contained in plastic 5 gallon bucket with screw on lid that ensures used contents are sealed and isolated until they can be properly cleaned. Do you own a plant dealing with hazardous products on daily basis? 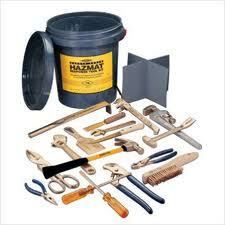 You’ll most likely need this AMPCO hazmat response safety tool kit in case the unexpected happens. Keep things safe around your plant and make sure you’ll run the business for a very long time.